Note: The IBM System x3550 M3 is now withdrawn from marketing. The replacement server is the IBM System x3550 M4. Figure 1 shows the IBM System x3550 M3. Five USB 2.0 ports available - two front, two rear, and one internal for an embedded hypervisor. Storage bay flexibility: Up to eight hot-swap 2.5" drive bays for SAS or SATA HDDs, or solid-state drives (intermixing supported); or four 2.5" bays plus an internal optical drive bay. The x3550 M3 includes an Integrated Management Module (IMM) to monitor server availability, perform Predictive Failure Analysis, and trigger IBM Systems Director alerts. Text Console Redirection support allows the administrator to remotely view x3550 M3 text messages over Serial or LAN connections. Integrated Trusted Platform Module (TPM) 1.2 support. Industry-standard AES NI support for faster, stronger encryption. The x3550 M3 servers offer Chipkill ECC memory protection (when using x4 DIMMs). Chipkill memory is up to 16 times better than standard ECC memory at correcting memory errors. This can help reduce downtime caused by memory errors. The x3550 M3 offers memory mirroring for redundancy in the event of a non-correctable memory failure. Toolless cover removal provides easy access to upgrades and serviceable parts, such as HDDs and memory. Similarly, the Virtual Media Key and the ServeRAID controller can be installed and replaced without tools. This means less time (and therefore less money) spent servicing the x3550 M3. 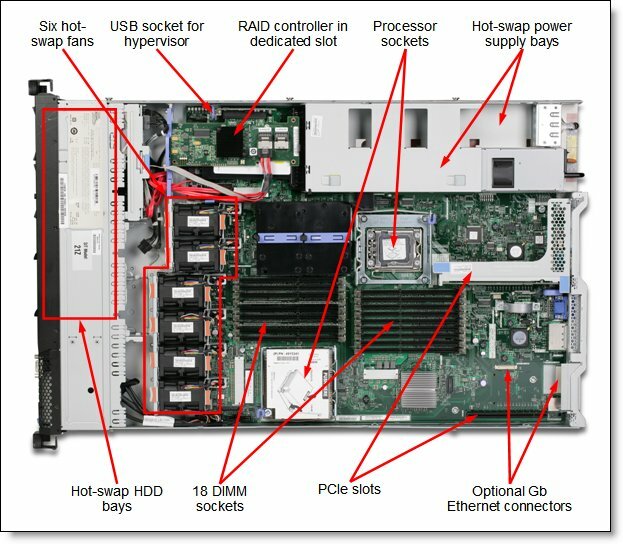 The server offers hot-swap and redundant fan modules and power supplies and hot-swap disk drives (redundant when implemented in conjunction with a RAID controller). These features mean greater system uptime. The drop-down light path diagnostics panel and individual light path LEDs quickly lead the technician to failed (or failing) components. This simplifies servicing, speeds up problem resolution, and helps improve system availability. Low-voltage processors draw less energy and produce less waste heat than high-voltage processors, thus helping to reduce data center energy costs. Available 4-core Xeon 5600 series processors use only 40 W and 6-core processors consume as little as 60 W.
Support for 1.35 V low-voltage DDR3 memory DIMMs that consume 20% less energy. Energy-efficient components, including low-voltage transistors and voltage regulator modules, and power supplies that are up to 90% efficient. The x3550 M3 uses hexagonal ventilation holes in the chassis. Hexagonal holes can be grouped more densely than round holes, providing more efficient airflow through the system chassis. This ultimately results in reduced operational costs. An altimeter works in conjunction with the IMM to govern fan rotation based on the readings that it delivers. This saves money under normal conditions because the fans do not have to spin at high speed. Figure 2 shows the front of the server, with key components identified. Processor Up to two six-core (up to 3.46 GHz) or quad-core (up to 3.6 GHz) Intel Xeon 5600 series processors with QuickPath Interconnect technology up to 6.4 GT/s, and up to 1333 MHz memory speed. Memory cache Up to 12 MB L3. Memory Up to 18 DIMM sockets (9 DIMMs per processor). Up to 288 GB with 16 GB DDR3 RDIMMs and 18 populated DIMM slots (up to 144 GB with 9 DIMMs per processor), or up to 48 GB with 4 GB DDR3 UDIMMs and 12 populated DIMM slots (up to 24 GB with 6 DIMMs per processor). Memory protection ECC, ChipKill (for x4-based memory DIMMs), Memory Mirroring, and Memory Sparing. 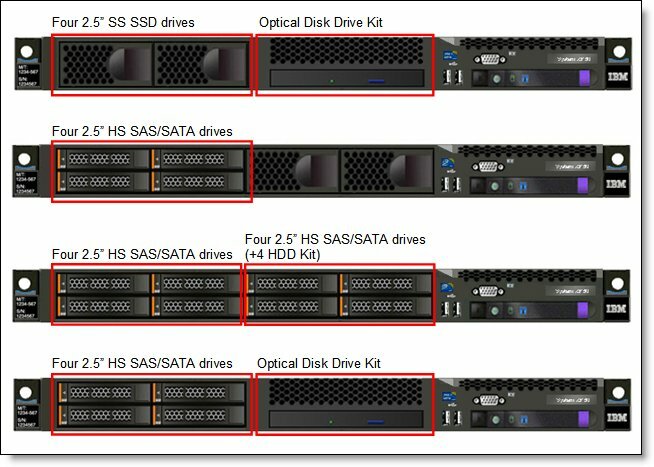 Disk drive bays Up to eight 2.5" hot-swap SAS/SATA HDDs or solid-state drives (SSDs). Maximum internal storage Up to 7.2 TB with 900 GB SAS HDDs, or up to 8.0 TB with 1 TB SATA HDDs, or up to 1.6 TB with 200 GB SSDs. Intermix of SAS/SATA/SSD is supported. RAID Support RAID 0, 1, 1E with ServeRAID-BR10il v2 or M1015; RAID 0, 1, 5, 10, 50 with M5014 or M5015. Optional upgrade to RAID 5 is available for M1015. Optional upgrade to RAID 6, 60 is available for M5014/M5015. Optical drive bays One with optional Optical Drive Enablement Kit, support for DVD-ROM or Multiburner. If used, the maximum number of HDD bays is limited to 4. Network interfaces Integrated 2 Gigabit Ethernet ports, plus 2 ports on optional Gigabit Ethernet with Ethernet Daughter Card (does not consume PCI slot). Each slot is implemented using a riser card. Each PCIe riser card can be replaced with a PCI-X riser card offering one PCI-X 64-bit/133 MHz slot. External ports Two USB 2.0 and one DB-15 video on front. Two USB 2.0, one DB-15 video, one DB-9 serial, one RJ-45 systems management, up to 4 RJ-45 Gigabit Ethernet network ports (2 standard, 2 optional) on rear. One internal USB port for embedded hypervisor. Cooling IBM Calibrated Vectored Cooling™ with 6 counter-rotating hot swap fans with N+1 redundancy. Altimeter is to control fan speed based on atmospheric pressure. Power supply Up to 2 redundant hot-swap 460 W AC or 675 W AC or 675 W high efficiency (HE) AC power supplies with 90%+ efficiency. 675 W -48 V DC models are available via CTO. Hot-swap components Hard drives, power supplies, fans. Systems management UEFI, IBM Integrated Management Module (IMM), Predictive Failure Analysis, Light Path Diagnostics, Automatic Server Restart, IBM Systems Director* and IBM Systems Director Active Energy Manager™, IBM ServerGuide. Optional Virtual Media Key for remote presence (graphics, keyboard & mouse). Video Matrox G200eV with 16 MB memory integrated into the IMM. Maximum resolution is 1280x1024 at 75 Hz with 16M colors. Operating systems supported Microsoft Windows Server 2003 and 2003 R2, Microsoft Windows Server 2008 R2 and 2008, Microsoft Windows Server 2012, Red Hat Enterprise Linux 4, 5 and 6, Red Hat Enterprise MRG 1.0/2.0 Realtime, SUSE Linux Enterprise Server 10 and 11, VMware ESX 4/4.1 and VMware ESXi 4/4.1 embedded hypervisor, Sun Solaris 10, VMware vSphere 5/5.1. Limited warranty Three-year customer replaceable unit and onsite limited warranty with 9x5/next business day (NBD) response time. Service and Support Optional service upgrades are available through IBM ServicePacs®: 24x7/next business day or 4 hours onsite repair, 1-year or 2-year warranty extension, remote technical support for IBM hardware and selected IBM and third-party (Microsoft, Linux, VMware) software. The following table lists the standard models. All models are withdrawn from marketing as of June 30, 2013. The System x3550 M4 is a suitable replacement. † In the processor column: Standard quantity of processors, processor model, core speed, cores, L3 cache, memory speed. (b) The ServeRAID M5015 RAID controller in this model includes a battery. The following table lists the express models. Express models are typically only available in certain countries. All models are withdrawn from marketing as of June 30, 2013. The System x3550 M4 is a suitable replacement. Intel QuickPath Technology (QPI), a platform architecture that provides high-speed (up to 25.6 GBps), and point-to-point connections both between processors and between processors and the I/O hub. Each processor has its own dedicated memory that it accesses directly through an Integrated Memory Controller. In cases where a processor needs to access the dedicated memory of another processor, it can do so through the high-speed QPI that links all the processors. Turbo Boost Technology dynamically turns off unused processor cores and increases the clock speed of the cores in use. It will increase the frequency in steps of 133 MHz (to a maximum of three steps or 400 MHz) as long as the processors’ predetermined thermal and electrical requirements are still met. For example, with three cores active, a 2.26 GHz processor can run the cores at 2.4 GHz. With only one or two cores active, the same processor can run those cores at 2.53 GHz. All Xeon 5600 processors support Turbo Boost with the exception of L5609, E5607, E5606, and E5603. Intel Hyper-Threading Technology, which boosts performance for multi-threaded applications by enabling simultaneous multi-threading within each processor core, up to two threads per core. Hyper-Threading reduces computational latency, thereby making optimal use of every clock cycle. All Xeon 5600 processors support Hyper-Threading Technology with the exception of L5609, E5607, E5606, and E5603. Intelligent Power Capability powers individual processor elements on and off as needed, to reduce power draw. Execute Disable Bit functionality can help prevent certain classes of malicious buffer overflow attacks when combined with a supporting operating system. The server supports the processor options listed in the following table. The server supports up to two processors. The table shows which server models have each processor standard. If there is no corresponding where-used model for a particular processor, then this model is only available through CTO. Each CPU has three memory channels, and there are three DIMMs per channel. RDIMMs can be populated three per channel. However, UDIMMs can only be populated two DIMMs per channel. That is, you can have up to 18 RDIMMs installed in the server, but only up to 12 UDIMMs. Mixing UDIMMs and RDIMMs is not supported. Dual-core Intel Xeon 5500 series processors only support memory speed at 800 MHz. The server supports both 1.5 V and 1.35 V DIMMs. Mixing 1.5 V and 1.35 V DIMMs in the same server is supported for Intel Xeon 5600 series processor-based systems, in such a case all DIMMs operate at 1.5 V. Intel Xeon 5500 series processor-based systems do not support 1.35 V DIMMs. If memory mirroring is used then DIMMs must be installed in pairs (minimum of one pair per CPU), and both DIMMs in a pair must be identical in type and size. If memory sparing is used then DIMMs must be installed in sets of three, and all DIMMs in the same set must be identical in type and size. Memory sparing is only supported in systems with Intel Xeon 5600 series processors installed. The following table lists memory options available for x3550 M3 server. * Maximum supported with two processors installed. With one processor installed, halve the number. The following figure shows these. Standard models of x3550 M3 ship with four SAS/SATA 2.5" SFF hot-swap hard drive bays. The following table shows the option available for x3550 M3 server to add four additional hot-swap drive bays. Option 59Y3992 upgrades models with four hot-swap HDD bays to eight hot-swap HDD bays. If the server already has an optical disk drive installed, the drive must be removed first. For model A2Y, this upgrade also requires a new RAID controller (M1015, M5014, or M5015) to be purchased. The following table lists the RAID controllers and additional options used for internal disk storage. The RAID controllers listed in the previous table occupy a dedicated PCI-E slot on x3550 M3 and do not consume regular PCI-E slots. Only one RAID controller can be used with the server to support internal HDDs. The following table lists hard drive options for internal disk storage of x3550 M3 server. The x3550 M3 server requires the Optical Drive Kit (ODD Kit), 59Y3952, to be installed to support the optical drive. If the ODD Kit is used, then the maximum number of HDD bays is limited to four. The following table lists the PCI riser card options. The server has an additional PCI Express slot dedicated to the RAID controller. x3550 M3 supports up to four integrated Gigabit Ethernet ports. Two ports are standard, and two ports can be added by installing an optional Dual-port Gigabit Ethernet Daughter card. This card uses a dedicated connector on the motherboard and does not consume a PCI expansion slot. The following table lists storage adapters supported by x3550 M3 server. The server supports up to two redundant power supplies, providing N+N redundancy. Standard models come with one or two power supplies (model dependent). -48V DC models are only available through CTO. The following table lists the power supplies. * At least 1 power supply comes standard with some models. An AC power supply ships standard with one 2.8 m C13 - C14 power cord. A DC power supply ships without power cords. The server contains IBM Integrated Management Module (IMM), which provides advanced service-processor control, monitoring, and an alerting function. If an environmental condition exceeds a threshold or if a system component fails, the IMM lights LEDs to help you diagnose the problem, records the error in the event log, and alerts you to the problem. Optionally, the IMM also provides a virtual presence capability for remote server management capabilities. Server on: 10 to 35° C (50.0 to 95.0° F); altitude: 0 to 914.4 m (3,000 ft). Decrease system temperature by 0.75° C for every 1,000-foot increase in altitude. The IBM System x3550 M3 has a 3-year onsite warranty with 9x5/next business day terms. IBM offers the following warranty service upgrades through IBM ServicePacs. The IBM ServicePac is a series of prepackaged warranty maintenance upgrades and post-warranty maintenance agreements with a well-defined scope of services, including service hours, response time, term of service, and service agreement terms and conditions. IBM ServicePac offerings are country-specific. That is, each country might have its own service types, service levels, response times, and terms and conditions. Not all covered types of ServicePacs might be available in a particular country. For more information about IBM ServicePac offerings available in your country, see the IBM ServicePac Product Selector at: https://www-304.ibm.com/sales/gss/download/spst/servicepac. 24x7x2 hour A service technician is scheduled to arrive at your customer’s location within two hours after remote problem determination is completed. We provide service around the clock, every day, including IBM holidays. 9x5x4 hour A service technician is scheduled to arrive at your customer’s location within four business hours after remote problem determination is completed. We provide service from 8:00 a.m. to 5:00 p.m. in their local time zone, Monday through Friday, excluding IBM holidays. If after 1:00 p.m. it is determined that onsite service is required, the customer can expect the service technician to arrive the morning of the following business day. For noncritical service requests, a service technician will arrive by the end of the following business day. 9x5/next business day A service technician is scheduled to arrive at your customer’s location on the business day after we receive your call, following remote problem determination. We provide service from 8:00 a.m. to 5:00 p.m. in their local time zone, Monday through Friday, excluding IBM holidays. The external disk storage expansion enclosures listed in the following table are available. The RAID controllers listed in the following table are supported and connect to external expansion enclosures. The hard disk drives listed in the following table are supported inside the above-supported external expansion enclosures. * Note: The EXP3000 and EX2500 series can be chained with each other. In such a case, one cable is used to connect first EXP25xx or EXP3000 to the RAID controller, and every consecutive EXP unit is connected to the previous one by one cable. The following table lists the external storage systems that are supported by x3550 M3 and can be ordered through System x sales channel. The server may support other IBM disk systems that are not listed in this table. Refer to IBM System Storage Interoperability Center for further information, http://www.ibm.com/systems/support/storage/ssic.